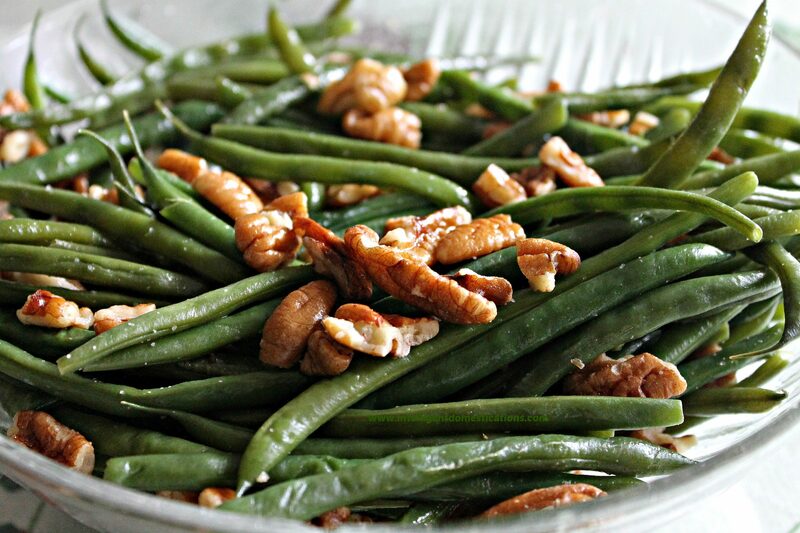 Have you ever added pecans to your green beans? My family always enjoys Pecan Glazed Green Beans. Fresh cooked whole green beans are one of our family favorites. There are so many different ways you can prepare them. This particular recipe is easy and scrumptious! I simply call it Pecan Glazed Green Beans. Snip the ends off the green beans, wash and drain. Place the beans into a pot of boiling water. Boil, for about 8 minutes and drain. Melt the butter and brown sugar in a skillet. Add in the pecans and drained green beans. Sprinkle with the Kosher salt and cook, tossing occasionally for about 5 or 6 minutes. The green beans will be nice and crispy, as well as tasty. The brown sugar will add the slightest little sweet glaze to the pecans. This recipe is perfect for your Thanksgiving or Christmas dinner anytime you may be entertaining guests. Snip the ends off the green beans, wash and drain. Place the beans into a pot of boiling water. Boil for about 8 minutes and drain. Melt the butter and brown sugar in a skillet. Add in the pecans then the drained green beans. Sprinkle with the salt and cook, tossing occasionally for about 5 or 6 minutes. Fresh green beans are such a nice treat! Sounds like a tasty side dish that’s perfect for the fall season. Will be including this in my MM round-up this week. Mmm, I love how buttery pecans are, I bet you don’t need anything…this sounds like a good way to use up end of season beans…right before the sweaters come out! It is simply delicious. I hope you get to try it, Christine. The pecans set it off! These look delish! I love green beans but haven’t made them this way so I will pin & try them later!! Thanks Tamara. Be sure to let me know how your family liked them when you make the Pecan Glazed Green Beans. Yummy, I made them today! I had to use walnuts because I realized all my pecans were gone:( But it still tasted great! Missed the pecans, though! I’m glad to hear that Zan! We love walnuts too, may have to try that. We live in the south where pecan orchards abound so pecans are usually in the cabinet. Oh men..I need to move to your area, I love pecans. But you know, I discovered I did have pecans in the pantry after I made it. Oh well. Hubby really enjoyed the slight sweetness in this recipe! Yummy! I’ve shared on Pinterest 🙂 Thank you for the recipe. Thanks for stopping by. I appreciate it. I will see you again at Pin-n-Tell. I am a green bean lover from way back and these sound wonderful! I will be trying these soon. Please tell me how you like them when you make them! I love green beans any time of the year. Looks yummy, pinning! Thanks for the Pin, I appreciate it. Hope you enjoy them when you make them. Looks yummy! I have fresh green beans in my refrigerator right now. I may just even try this out! Awesome, Zan, please come back and let me know how you liked them! I love green beans, but have never had them cooked this way! Looks delish! I’m pinning to remember! We really like them cooked like this, it is a little bit different which is nice.